Most digital assistants today have one major problem: their reliance on the internet. For any request, even simple ones, like opening applications, require an internet connection. Not only does this use cellular data, or require you to connect to WiFi, but it gives you significantly less privacy. Syna, on the other hand, will only send network requests when explicitly asked to. For example, if you were to ask Syna to download a program, only then would she connect to the internet. This isn't the only notable feature Syna possesses though. 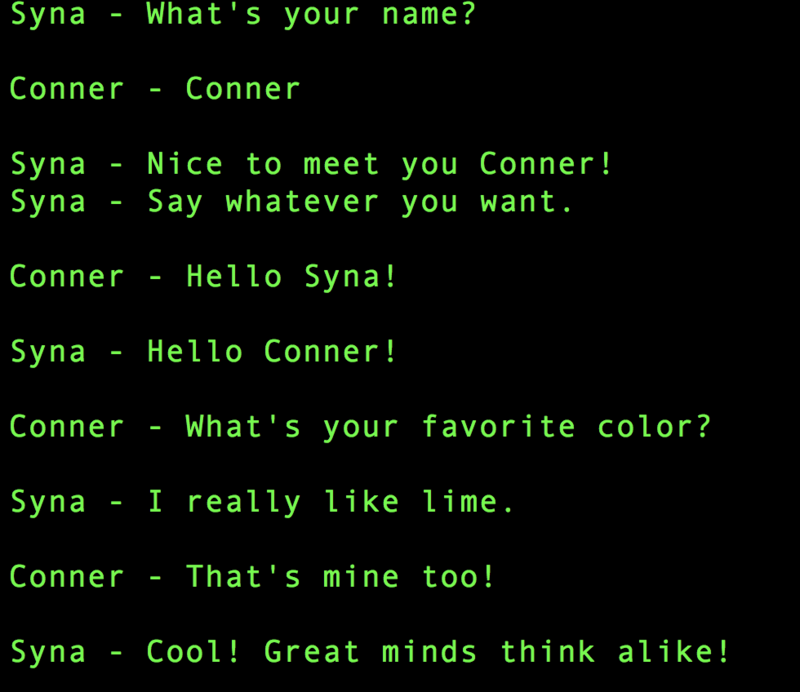 Unlike other virtual assistants, Syna is capable of carrying out conversations. In order to accomplish this, Syna has a complex memory system integrated that can identify possible references to previous questions with a fairly high accuracy. Since Syna works on a text based system, a large amount of effort was put into developing an algorithm that will allow her to parse inputs even with capitalization and punctuation mistakes. This means that Syna can detect periods, question marks, dashes, capitalization, and other details in order to make sense of the input given.